I nearly fell off my chair when I read the news that Yes wanted to release Drama (1980) and Tales From The Topographic Oceans (1973) live! 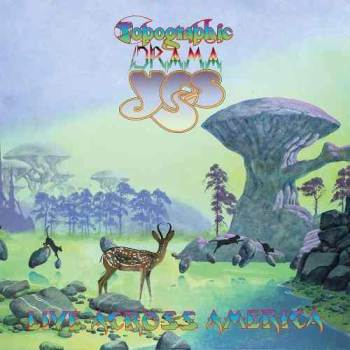 As I am a fan of Yes and Trevor Horn I always thought Drama was one of the better albums the band made. Even in the absence of Jon Anderson. You can find other interpretations of some Drama songs on Buggles' Adventures In Modern Recordings. And for Tales From The Topographic Oceans I always had a special place in my heart. Rarely I've listened to such complex compositions that worked out so beautifully from that era. I can remember I bought both albums at the same time back in the mid-eighties and played them over and over again. I tried to get them both live on bootleg, but the sound quality was not as good as I hoped it would be (obviously). Nevertheless I enjoyed listening to them. And now there is this release! On a personal note I think Yes is no more since the sad parting of Chris Squire. He was the glue that kept Yes together, now resulting in a group of grumpy old men that try to live on the old glory of the super band that once was. They are still an excellent group of musicians, don't get me wrong. As I looked at the track list I was glad all the songs from Drama were on it. A bit disappointed that not all Tales' tracks were played and also for the 6 millionth time Roundabout, And You And I, Heart Of The Sunrise and Starship Trooper are played. Of course they are all time classics, but they are practically on all Yes' live releases. Leaves Of Green was ripped out of The Ancient which makes an excellent quiet song after all. The group played this Jon Anderson /Steve Howe part live several times more on other shows. The first CD contains all songs of Drama. They are all excellently played and Jon Davidson doesn't even have to mimic the sound of Mr. Andersons voice, that should have been a relief. The keyboard and guitar pieces played by Steve Howe and Geoff Downes are of high quality as they are the only musicians who played it originally in 1980 along with drummer Alan White, although here he gets a little help from Jay Schellen. And hats off to Billy Sherwood too, I can't say that Chris' basslines are the most simple to play. Drama isn't a drama on this live album. It sounds crisp, and the band members perform it in an excellent way. On to CD 2. I understand playing these 2½ epic Tales songs are not one of the most simple tasks. As there are only two members of this group who wrote the original in 1973. I think it can be seen as a prestige project to play these live for the other musicians. And again they perform great! The four tracks mentioned before are spread on the two CD's. And of course they are fantastic. They sound good and play with great experience. OK, we are listening to music made by a selection of the greatest prog musicians, but I can't get rid of the feeling that I am listening to a Yes tribute band. It's a damn good one that's for sure! A critical note on the sound quality, the sound of the recording sounds a bit too clean when played on a lower quality stereo set. It demands a good HiFi set or headphones. I listened to this Japanese SHM-CD set on different equipment and if it's played on a lesser set you'll lose a lot of detail. Despite of a few disappointments it's still a must have for the Yes fan. Even if it's only for the beautiful Roger Dean cover.